629 King Residences, a new luxury condo building, is home to one of the longest outdoor swimming pools in North America and a luxury entertainment venue. 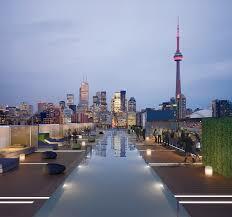 Lavalle is a rooftop lounge situated above 629 King Residences. It includes a 155-foot long pool. This members-only lounge charges a $200 annual fee. The pool area includes breathtaking views of the city from all directions. There is a cabana, garden, DJs, ice cream parlour, juice bar and multiple bars. There is a 250-seat dining room for more formal dinners. Part of the pool can be covered for use as a dance floor.